In 2006, a man tried to kill himself when he was diagnosed with schizoaffective disorder, by jumping off the Waterloo Bridge in London. A random passer-by proved to be an angel in disguise and dissuaded him. Today, years later, Jonny Benjamin, an ambassador for mental illnesses, is on a hunt to find his saviour (apparently called Mike) who approached him and offered to buy him a coffee and talk. Now a viral video, flyers and the Twitterati (#FindMike) have joined forces to find the angel. Spread the word, find Mike. 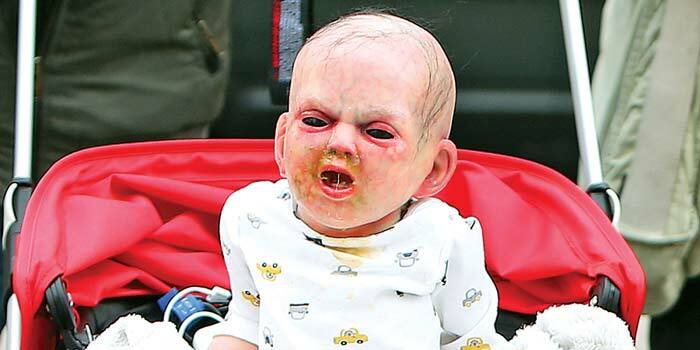 New Yorkers were in for the fright of their lives with the prank of a demon baby being sprung on them. A pram was fitted with a remote-controlled baby with blood across his face, bone chilling screams and projectile vomit, and left unattended. Good Samaritans who tried to peek in to the pram were in for a shock when the demonic baby popped out. And while the video has gone viral, what most people dona��t know is that the stunt was created to promote the found-footage horror film, Devila��s Due. This was indeed a treat for those who went to watch the pantomime performance of Peter Pan at Glasgowa��s Hydro. In the final song, the music stops, confusing spectators and one cast member. However, when the actor playing Peter Pan, Sandor Sturbl, asks his real-life girlfriend Jane Mary Sullivan who plays Wendy, to marry him, it was a fairytale ending. The heartfelt gesture was met with a huge cheer and applause from the audience as the actress said a�?yesa��.